This molded foam Collapsible Travel Tray folds flat for easy transport in your suitcase, briefcase or backpack and gives you an easy way to keep small items together in your hotel, car, airport, or destination. 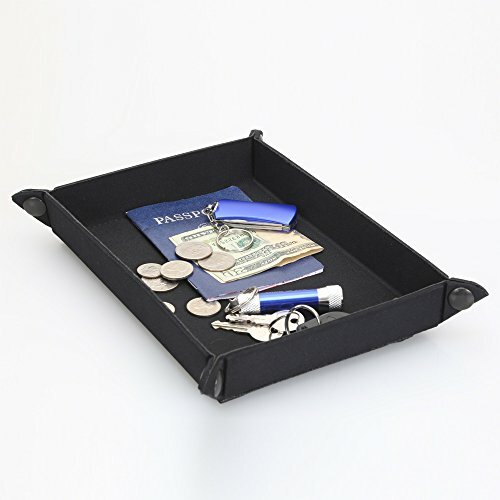 Measuring 6" x 8.5" x 1.5" when snapped together, and 8.5" x 11" when flattened, this Collapsible Travel Tray is a convenient way to keep your things organized while you travel. Place it on your nightstand in a hotel to keep your keys, phone, coins and wallet handy. Place it on your folding tray on an airplane so your phone, iPod, pens and pencils don't roll around or slide off. Keep it on the center console or dash of your car (only use on the dash if it is relatively flat and the tray does not obstruct your view) and put coins, your phone, or other small items in it. The tray snaps together with heavy duty buttons and folds flat with quick unsnapping. The back features a flush pocket for documents or cash, and has a nonslip surface to double as a grip for the tray. The whole thing is made out of durable molded foam and manufactured in the USA.